The Caltrain Corridor, home of the Silicon Valley innovation economy, holds much of the Bay Area’s promise and opportunity, but its transportation system is breaking down. Along this corridor — which includes Hwy 101 and Caltrain rail service from San Francisco to San Jose — the typical methods of getting around have become untenable. 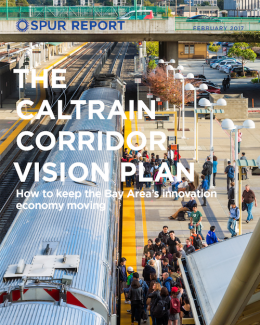 We propose a transformative vision for the corridor, where Caltrain and high-speed rail provide a backbone of modern, attractive rail service, growth is concentrated around transit stations, Highway 101 moves more people with less delay and it’s possible to reach more parts of the Peninsula by ferry. In this vision, people rely on options other than driving because they are convenient, functional and reliable. And because of the decrease in driving, California is poised to reach its climate goals. Rail: Develop reliable, frequent all-day rail service between San Jose and downtown San Francisco, with enough capacity to meet demand. Rail Stations and Last-Mile Connections: Offer quick and intuitive connections at modern, high-amenity stations. Highway 101: Move more people on Highway 101, with less delay, by creating a high-occupancy/toll lane and filling it with transit. Ferries: Establish public ferry service for Peninsula travelers at the Port of Redwood City. A Seamless Transit Experience: Create one coordinated and convenient transportation network across different service providers.